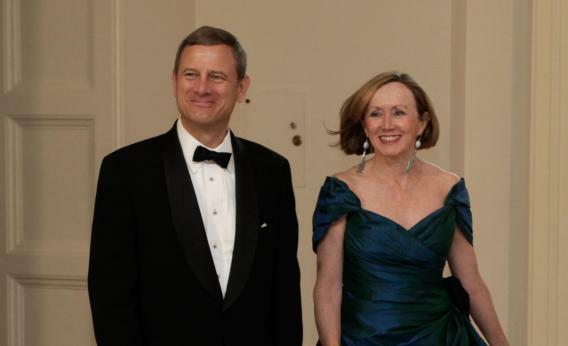 Chief Justice John Roberts and his wife, Jane, arrive at the White House for a state dinner in 2011. I’m not a mind reader, but I think I have a more convincing explanation of why John Roberts ultimately voted to uphold the Affordable Care Act than these theories that rely on a bankshot “long game” to alter Commerce Clause jurisprudence. My theory is that he embraced the individual mandate for the same reason that Mitt Romney embraced it as governor of Massachusetts and Bob Dole embraced it as minority leader of the U.S. Senate—it’s a reasonable mechanism for ensuring universal coverage without creating a government-run single purchaser of health care services. A lot of attention has been paid recently to the fact that once President Obama came to embrace that position, the conservative movement rapidly abandoned its own alternative to single payer. But the plaintiffs in the health care cases weren’t just asking the court to veto the law, they were asking the Supreme Court to declare the middle ground alternative to be now and forever impermissable. If that had happened, liberals would have had no choice but to start campaigning for Medicare for all. Would they have gotten it? Not in 2013, that’s for sure. But the problem of health insurance wasn’t going to vanish no matter what Roberts did. The employer-based system has been slowly unraveling for years and would continue to do so no matter what Roberts did. And the debate would be that either you’re for expanding access to health insurance by enrolling more people in government-run programs or else you’re against expanding access to health insurance—a very tough and polarizing debate in which the court had ruled that moderate solutions are illegal. Now you don’t have that. If Republicans win in 2012, they can roll the law back. If Democrats win in 2012, they can entrench the law. But either way the basic equilibrium of regulated privately owned insurers and regulated privately owned providers stays in place indefinitely.